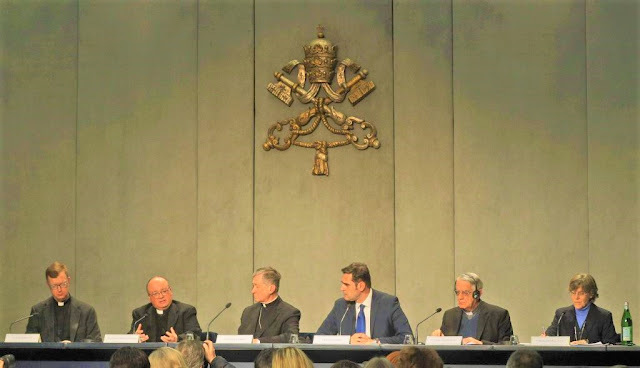 A Press Conference at the Holy See Press Office presents the “Protection of Minors in the Church" Meeting, which will take place in the Vatican, between 21 and 24 February 2019. Archbishop Charles J. Scicluna is Adjunct Secretary of the Congregation for the Doctrine of the Faith, and a member of the Organizing Committee for the “Protection of Minors in the Church" Meeting. During Monday’s Press Conference to present the Meeting, he made it clear that the event is part of a journey the Church undertook some time ago. It is important it create the right conditions for there to be a concrete "follow up", he said. The Bishops will return to their dioceses to continue the work, drawing up "procedures", being more aware of their responsibilities. When it comes to "protecting innocence", insisted the Archbishop, "we must not give up": we need to seek ever more adequate solutions to the problem, so that "the Church may be a safe place for everyone, especially children". Archbishop Scicluna also spoke of the "expectations" around this meeting, specifying that they need to be "reasonable". Not all the problems can be solved in three days, he said. Answering journalists’ questions, the Archbishop said it is important we move away from “the code of silence”, because silence is unacceptable, he added. Cardinal Blase J. Cupich is Archbishop of Chicago, and also a member of the Organizing Committee. He too replied to questions from the many journalists at the press conference, speaking of a "new dawn as far as transparency is concerned". The Cardinal made it clear that the Bishops present, for the most part Presidents of Episcopal Conferences, must clearly understand their responsibilities in this regard, and that a precise "program of safeguarding" can prevent a repetition of what happened in the past. Cardinal Cupich pointed out that many of those who will be taking part in the Vatican Meeting have met with victims, as requested by Pope Francis himself, and that each one carries “the wounds" of those who have suffered abuse by members of the Church, in their heart. Fr. Federico Lombardi SJ is President of the Joseph Ratzinger-Benedict XVI Foundation and Moderator of the Vatican Meeting. During the Press Conference, he illustrated how the three days of discussion will each be devoted to a specific topic: “Responsibility, Accountability, and Transparency”. The 190 participants present in the Vatican Synod Hall will hear three reports a day, from Thursday through Saturday. Three of these will be given by women, and all nine interventions will be followed by a question and answer session. Participants will also be broken up into working groups according to language. There will be testimonies from survivors and moments of prayer, at the beginning and end of each day. Pope Francis will open the Meeting with an introductory speech on Thursday morning, and close it on Sunday with a discourse after Mass. The Eucharistic celebration will take place in the Sala Regia at 9.30 am and Archbishop Mark Coleridge, President of the Australian Bishops' Conference, will preach the homily. A Penitential Liturgy will take place on Saturday afternoon, and will be broadcast live by Vatican News, as will the Mass on Sunday. According to Fr. Lombardi, members of the Organizing Committee will also meet privately with representatives of the victims and survivors’ associations. The official website of the “Protection of Minors in the Church” Meeting is www.pbc2019.org and will remain active even after the Meeting is over, as a "tool for developing future initiatives". Fr. Hans Zollner SJ is President of the Center for Child Protection at the Pontifical Gregorian University. He is also a member of the Pontifical Commission for the Protection of Minors and the contact person of the Organizing Committee. At the Press Conference, he illustrated the website, which he said will be updated regularly. Finally, Sr. Bernadette Reis, Assistant to the interim Director of the Holy See Press Office, presented the digital press kit that has been made available to support and assist journalists and media representatives with their work.